Nantucket Historic District is the finest surviving architectural and environmental example of a late 18th- and early 19th-century New England seaport town. The whaling industry in America originated on the island of Nantucket in the late 17th century, as colonists followed the example of the island's original American Indian inhabitants. Initial attempts were unsuccessful until Icabod Paddock of Cape Cod moved to Nantucket to serve as a whaling instructor in 1690. Nantucket acquired its first whaling sloop in 1694. The island possessed a total of 28 offshore whaling vessels by 1727 and began building its own ships in 1730. Nantucket's fleet continued to grow and dominate the whaling industry. Of the 250 New England ships engaged in whaling in 1774, Nantucket claimed 150 of them. Nantucket whalers sold most of their oil to London, thus the forthcoming Revolution greatly affected the island's commerce. Nantucket regained supremacy in whaling after the Revolution and retained it until the early 1840s when its competitor, New Bedford, Massachusetts, counted a greater number of whalers. Other factors contributed to the Nantucket whaling industry's demise, including the 1846 fire that destroyed the town's commercial center and wharves, and the 1849 California Gold Rush that lured some 400 young men away from the island. In addition, the formation of sand bars, which made it impossible for the increasingly heavier ships of the early 19th century to dock at the town, forced Nantucket whalers to Edgartown Harbor on the island of Martha's Vineyard. 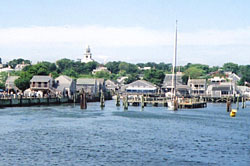 Nantucket developed much of its present appearance in the 18th century. Dwellings from this time, including the Nathaniel Macy House at 12 Liberty Street and the Tristram Bunker House at 3 Bear Street, are similar to those built in the 17th century, which were utilitarian and with little ornamentation or detail. By the early 19th century, the island's architecture shifted towards classical detail, and the Federal style is evident in such buildings as the Second Congressional Meetinghouse of 1809. The Golden Age of Nantucket began about 1820 and the large homes built between 1820 and 1850 are indicative of local sea captains' and merchants' wealth. The most outstanding buildings are situated on Orange and Main Streets where sea captains commonly built two-story dwellings with white clapboard siding and views of the harbor. Successful merchants and ship owners built elegant mansions, like the Hadwen-Wright House at 94 Main Street and its twin at 96 Main Street. Immediately following the devastating fire of 1846, the entire commercial district was rebuilt with new two and three-story brick stores. 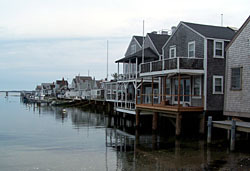 The Nantucket Historic District, a National Historic Landmark, encompasses the entire island of Nantucket. Nantucket Visitor Services, located at 25 Federal St. in the Town of Nantucket, provides visitors and residents with information about current events, museums, tours, restaurants and lodging. Architectural walking tours of the town are offered in the summer at 9:30am on most Wednesdays and Thursdays; visit the Nantucket Preservation Trust website for further information. Visit the Chamber of Commerce's website for further visitor information or call 508-228-1387.